Everybody loves a cute pincushion. Just for fun, we’re sharing this Sweet Liberty Tuffets pattern with you. For you to make and do with as you please. All you need are scraps or a charm pack or two. Depending on which one you have, one will do as all seven of these Tuffets were made with a single charm pack of Bar Harbor (circa 2010) from Minick & Simpson. The tuffets measure between 4″ x 4″ and 5″ x 5″. Charm packs or scraps – all that’s required is a little bit of fabric. If you’re curious about the pattern, it is now officially “out of print”. These are so cute. Tiny, tiny sewing pieces, but I just love these. Thank you for sharing the patterns! Thank you for the patterns for these “precious gems”. I can hardly wait to make a couple of them!! How sweet of you! Thank you so much! Thank you so much for the pattern ! I love them! I love these pincushions! This post reminds me that I have this pattern and a stash of Minick & Simpson fabrics. So what am I waiting for? Thank you! 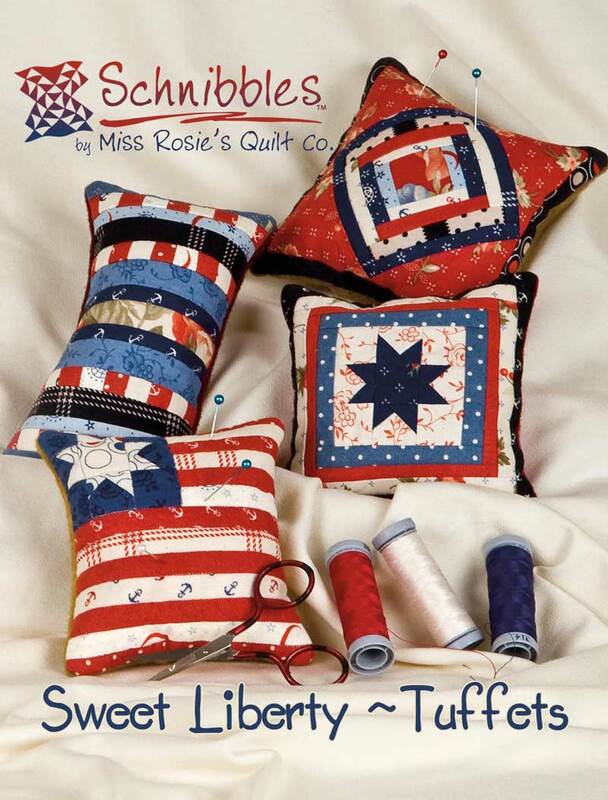 I can see some lovely Christmas gifts for my quilting friends! Very generous to share this….. Thank you!! Are they paper pieced? With such small pieces it would be much easier to do that way? Either way they are adorable. I can see making some in the Grow or Brighten Up by Me and My Sisters. These are just adorable! Thank you for sharing wth us! Oh! So cute!! Thanks for sharing the pattern!!! Thank you!! The sewing group I belong to will have a Christmas exchange and these pincushions will make great gifts. Thank you for your many kindnesses to us. You are more than generous! That’s so sweet of you thanks for sharing this pattern with us you’re the best!!! Thank you..thank you…very generous of you….hope Moda comps you in a big way !! Thank you for such a sweet treat! There is something addictive about making pincushions; I love to look for old ones when I travel. Thank you for sharing your patterns with us. Thank you for generosity in sharing your pincushion pattern with your readers! I love them all! Thanks for the sweet treat! I do have the pattern somewhere, but now that it’s on my desktop, I will be able to find it–lol! Thanks for this. So nice of you and Moda. No sewing for me today as I’m suffering with Hermine and no power. At my local library. These are wonderful and just perfect for the Labor Day weekend. Thank you for sharing them with us! A sweet little treat, indeed! Thank you! Thank you, Carrie, what a nice gift. I have so many of your patterns and all of your books. But I didn’t have this one until now. Have a wonderful Labor Day weekend. Thank you for the free pattern. It will be a great way to use up some scraps. I purchased the pattern (and made a few of them) awhile ago. Not difficult and the results were adorable. Made several as my guild gift exchange gift a few years ago … well received! Thanks for sharing! Thank you!! So very generous of you! I think I still have some Bar Harbor in my stash, but they would look absolutely adorable in so many other lines as well. Good time to make up a few Christmas gifts. Thank you Carrie! I love making tuffets and it’s so nice to have some new ideas. Happy 3 day weekend! Thank you for sharing! One can never have enough pin cushions, and they make wonderful “just because I appreciate you” gifts. Have an enjoyable Labor Day weekend. Thank you for sharing this cute pattern. Love them all. Thank you, I have always loved your pincushion patterns! Thanks for sharing! These are so fun to make!